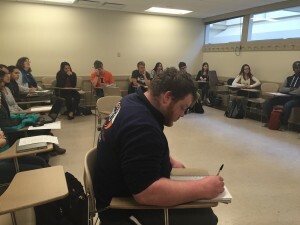 Video games and the related entertainment industry is a growth field for English/CW majors and anyone else interested in making creative content, but it’s also highly competitive, drawing people from a wide range of fields who love video games. 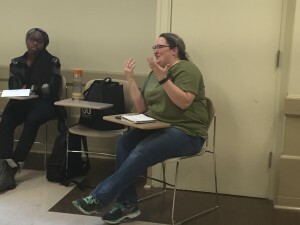 To learn more about how English/CW and other humanities majors can position themselves to enter this industry, we brought Anne Odom to campus on April 12. Anne works as a project manager for DS Volition, the video game company here in Champaign. It’s not the career one might expect from someone who majored in philosophy and minored in Russian literature in college, but Anne argues that her experience in making arguments. wrestling with complex material, and using her intellectual curiosity has helped her be good at what she does. In the course of her talk, Anne told us that “I have a lot of ideas!” is a terrible opening gambit for getting the attention of a potential employer in video games. Everyone has ideas, she pointed out. It doesn’t make you interesting. Later I pressed her on that response a little. After all, every industry needs people with good ideas. How do you identify the people whose ideas are worth paying attention to? Anne explained that it’s really easy to have good ideas, but it’s a lot harder to make them work. If you want someone to be impressed with your ideas, then turn them into something. “Make something!” she said. An app, a game, a graphic novel, a video, a screenplay. “Even better?” She went on, “Make something with someone else — that shows that you know how to work with people on your ideas.” She specifically suggested that “word people” like English/CW majors can benefit from pairing up with someone with artistic skills to create something that is both narratively and visually compelling. The summer month s stretch ahead of you. If your summer location doesn’t give you much scope for a career-focused job, if you need to make money waiting tables instead of taking an unpaid internship, if you left it too late to find a resume-building opportunity…you can always make something. This entry was posted in career, job search, plan, strategy, writing by KW. Bookmark the permalink.